Early this morning I got a phone call from former ACT deputy Chief Minister, David Lamont. I’d spent Saturday night sitting next to him during our live election broadcast on 666 ABC Canberra, and I was mightily impressed by his ability to crunch the numbers and put it all into perspective. Anyway this morning he was urging me to take a look at the latest numbers from Ginninderra. Lamont was claiming Greens leader Meredith Hunter was in trouble, not from Chic Henry from the Motorists’ Party, but from a third Labor candidate. He’s right. Later in the day ABC election guru Antony Green confirmed the Labor vote in Ginninderra was spreading evenly, and there was a growing chance Mary Porter, Chris Bourke and Yvette Berry might all get elected ahead of Hunter. This development also underlines that there’s often a big difference between pre-poll votes and those cast on the day. On election night a few Labor hard-heads were expressing disappointment with the vote in Ginninderra, given it’s long been considered Labor Party heartland. It now seems to be returning to normal. Lamont also told me to keep an eye on the Green vote in Molonglo. He says there’s a strong chance preferences could see Caroline Le Couteur overtake Shane Rattenbury for that one Green seat. And if Hunter loses, that would make Le Couteur the most powerful politician in the ACT. Four years ago she was the most reluctant politician in the ACT. Some other possible outcomes. Simon Corbell’s still looking shaky. But he looks shaky every four years, and always manages to scrape through. If he does fall short, it will leave Katy Gallagher short of an Attorney General. And no obvious replacement. Except one. Shane Rattenbury. I know a lot of things have to fall into place before this can even be contemplated. Corbell losing his seat, Rattenbury winning his – but Rattenbury is already the Greens’ shadow Attorney General, and it would be a natural fit. The horse trading began as well today. Zed Seselja told me on 666 breakfast this morning he’s happy to talk about light rail with the Greens, and might even reverse his decision to overturn the plastic bag ban. Enough to win Green support? Probably not. But it’s a start. Of course, if the Assembly ends up eight, eight, one, Seselja has no chance. And if anyone tells you they are confident who the 17 MLA’s will be, they’re lying. Hare Clark still has some surprises to come. 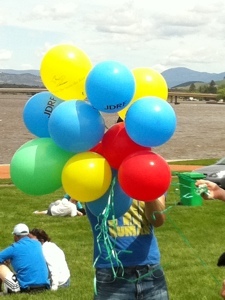 A man waits to release balloons to celebrate the election result. And grows old. ← Day one. What do we do next? Hey Ross – check out my comment made at http://ning.it/H62Shr (near to last comment) – 7pm Sunday night I predicted an 8-8-1 result. All the wise men follow me! Including Lamont and Green.